My Relief Society does something remarkable, that makes me rejoice about what Relief Society can be. We call it our Women of Faith Lecture Series. Every month or so, a different sister tells us her story of faith–which is just as often her story of doubt, and trials, and questions–and then the floor is opened for a very rich and intimate Q&A. I have experienced nothing else like it in Mormonism. The first one I attended was by “East River Lady.” She spoke about some of the things she wrote about here. It was powerful. The second I attended was my own. 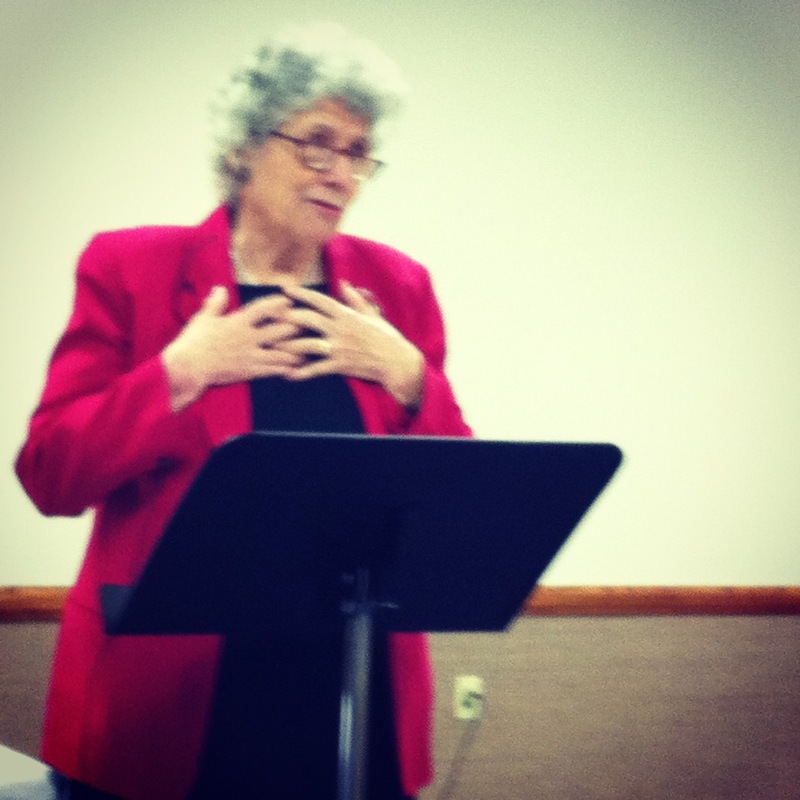 I spoke about researching Heavenly Mother full-time, and some of the joy and sorrow that came. The third I attended was recently: it was by beloved Claudia Bushman. She shared her story of collecting stories, and of keeping her own. One of the very first things that Claudia said is that while she fought keeping records for half of her life, she now thinks that it is the very most important thing we can do. She went on to explain that “if dates and names for your family are in the archives, you can access them, but there are other things that you know, that if not recorded will be lost forever.” I forget the specific examples she used here, but essentially they were experiences; they were stories. Then Claudia acknowledged that it can be quite overwhelming to go backwards in recording such stories, and that it is not always possible. She quipped that “the dead can take care of themselves in many ways,” before adding that a better place to start may be with ourselves. Next she introduced the Claremont Women Oral History project, which I have written briefly about before, and its “records which are pure gold.” It details “real Mormon lives” with “real honest statements.” The impetus actually started many years before in Pasadena, California, after a prominent member died without having written anything. Claudia was asked to talk to the sisters about writing. Returning to the Pasadena project, Claudia said, “We are used to promising things that we don’t do.” Many people promised to follow the syllabus, and didn’t. “Some promised and did it. Some didn’t promise, and did it.” Each person who participated expressed gratitude. Claudia read a snippet of an oral history by a woman whose great-grandmother personally knew Joseph Smith. It was a simple story with a feeling that Joseph was kind. In many ways, that was all it could be, as it was not the narrator’s memory directly, but her memory of a memory. This was contrasted to another oral history snippet. The story was not about Joseph Smith, and it was not simple. It was about the woman’s abusive stepfather, and one elaborate way she and her sister banded together to stop him. It was colorful, and rich, and present, and could be, because the narrator told the story herself. A few more details were shared about the book and the project, including how Mormon oral histories proved such a successful and worthwhile endeavor that it inspired Claremont Graduate University to take on other oral history projects highlighting other religions. Claudia shared another story about a woman who did not want to be baptized when she was a girl, but ultimately was, because her parents threatened to give away her horse, and she didn’t want to lose her horse, even more. The woman was grown now, along with her own children, but she had never told them that story; she was nervous for them to learn the details. Then she shared a narrative written by a polygamist woman, named Emma Nelson. * Unfortunately, I didn’t take very good notes here, and perhaps to prove Claudia’s previous hypothesis true, I don’t remember very well here, either, only that the woman’s feelings of love and loneliness were more nuanced and varied than we often hear. “People who do this are grateful.” Our stories will be a “guaranteed best seller. Everyone will stay up all night to read it. Everyone will learn new things.” I have to agree with her because of two slim volumes that I cherish, that contain loved voices from my dust. Someone asked her about the way she writes journals. “What do you put in?” Her answer was perfect: “Everything makes a difference.” And then it became even more sweet, because she explained that she writes about mundane things, like crossword puzzles, and basketball games, in addition to letters received and grand-babies born. Another question brought an audience comment from another friend about the transformative nature of oral histories, and how sometimes the silence is important. Claudia agreed, and added that there is a relationship between the person who asks the questions and the person who answers. A final call by Claudia: “Put words to paper.” This is what can last. This is the way we can say we were here, we felt, we lived, we mattered. *Claudia reminded me of this, after Mark B. reminded me that what I originally wrote (Anne Morrow Lindbergh) was likely incorrect. Which it was. Almost every day I think about this. About writing my life. I write it in my head. Sometimes I put snippets on a blog post or in a poem. What Claudia describes does feel like a lot of work. But I admit, I agree: it may be the most important work we can do. Thank you (and Claudia) for sharing this and for nudging us along. I do that kind too, Melody. The recording snippets of my life in a blog post, or poem, or email. The linear kind is harder, maybe, and takes a different kind of concerted effort. Lately I have been thinking about all of the memories and stories I have to tell, that I want to write down, so I might start there, even though it won’t be linear, either. Rachel, your Relief Society sounds like a dream. If I ever get a chance to be in a Relief Society presidency again, we will have a Women of Faith Lecture Series like yours. Thank you for taking notes and sharing them with us. I also strongly believe people should write about their lives. Last week I got a lovely surprise, which was scanned copies of nearly 200 of my grandpa’s letters delivered to me via drop box. He didn’t keep a journal as far as I know, but the letters span almost 20 years and sort of function like one. They’ve been delightful to read. I used to hear sermons in church fairly often about journal-keeping, and when I was baptized at 8 I received a journal. I remember thinking, “Now that I’m a member of the Church, I should keep a journal, that’s what Mormons do.” I don’t hear sermons about journal-keeping anymore, which is OK, I think, because it’s not a critical part of discipleship. But I still think it’s important. Melody said something that has stuck with me, which is (I paraphrase), we all go through life a little lonely for God and for each other. I think journal-writing helps fill both kinds of loneliness, and bridges the gap between generations in a way nothing else can. For my own journaling, I’ve created an “Emily’s journal” email address. It’s simple enough that I actually do it. I am glad Claudia Bushman is encouraging people to write about their lives. I realize she is being intentionally provocative, but I can’t agree with the second part of her statement: “If you don’t write it, you will forget it. If no one writes it, it didn’t happen.” I feel that the practical work of making dinner each day, making beds, wiping bottoms, supervising homework, washing dishes, etc. amounts to a great deal, and it doesn’t require being written up to be important. These tasks take up a good deal of time for much of many women’s (and some men’s) lives, and they happen, invisible though they may be. To say everything needs to be written to be sanctified, memorialized, and made real puts an unfair burden on people, and it’s just not helpful. Acting in the immediate yet limited sphere of our lives is all most of us ever do, but it’s critical and meaningful to the few people around us who need us, and that is OK. My loved ones don’t need me to write about what I do for them, they just need me to do it. The fact of it happening is written in their bodies and in their hearts. Still, I believe in writing. Email as journal does seem like a rather perfect way to go. A friend of mine shared with me that he set up email accounts for his children the day that they were born, and that he emails them experiences as they happen, so when they get a bit older and he turns the account over to them, they will have a dad-perspective journal. I loved the idea so much that I have implemented it a tiny bit for my own child. And I already send reminders to myself that way, I could also use it for something more meaningful. My sense was that Claudia didn’t think the living of events wasn’t also important-including the repetitive events such as cooking or cleaning-but that a forgetfulness comes from not recording. We don’t know what we’ll remember in the future, and after we are lost to this world, our memories are lost with us. Like you said, this might also be ok, because these actions are real anyway. They are real for us and the people in our small but significant spheres. I absolutely agree that they have importance whether they are recorded or not. The act of recording is its own thing, and it is hard work that not everyone can expend the resources towards. Life is always such a balancing act as it is. I think back about experiences like my mission, where I only wrote in my journal when things were going poorly or companionships felt difficult. I never wrote when I was happy or when I was making some of the dearest friendships, because I was too busy enjoying those people and conversations. I regret this a little, because now when I peek at my journal from that important life time, it doesn’t reflect very well the whole of it. And since my daughter’s birth, and even before, since my pregnancy, I have written very little. I have been so tired. This write-up gave me chills. This project is so, so, so incredibly important. I had the privilege of interviewing a few women and transcribing their histories, and it literally changed my life. It was a sacred, beautiful experience. I have been able to interview a few women too, and it was genuinely one of the best experiences I have had. I have written about it before, and how I came away with greater love and appreciation of each of the women I interviewed, that I already loved and already appreciated. The asking and listening of it felt holy, like you expressed. I am glad you have tasted this good fruit as well. I would love to hear more about the lecture series…is it held on an evening, or during RS block? As a Primary worker, I would love to attend something with adult interaction, but in my stake the only offering is a scripture study for single adults. Naismith, it is held on an evening, the second Wednesday of each month, though I do believe there are a few months where it doesn’t happen. There are often more women present than in Sunday Relief Society meetings, perhaps because like you alluded to, it lets those in Primary, Young Womens, and Nursery come. Rachel – thank you for posting these marvelous notes. A recurring theme in my life of late – things I’ve read, listened to, and been deeply attracted to – has been Ms. Claudia Bushman and this oral history project. Thank you for adding to it, and I am reinvigorated to get back to my questions and finish my oral history! I find myself recently called to a Relief Society presidency, and I want to start a Women of Faith lecture series. It sounds absolutely marvelous. Would you mind passing along any info you know about how your Relief Society sets this up – who is asked, what type of guidance are they given (if any), etc – any info would be helpful in pitching the idea to our President. Thank you again for your notes. I just loved them. I really wish every Relief Society could have one, so I am so glad to hear that you’re interested. I will see if the women who started it will pop in and add some thoughts, but for now I can tell you what I know. The woman who invited me knew that I researched Heavenly Mother for BYU, and thought other women would like to learn more about my experience. 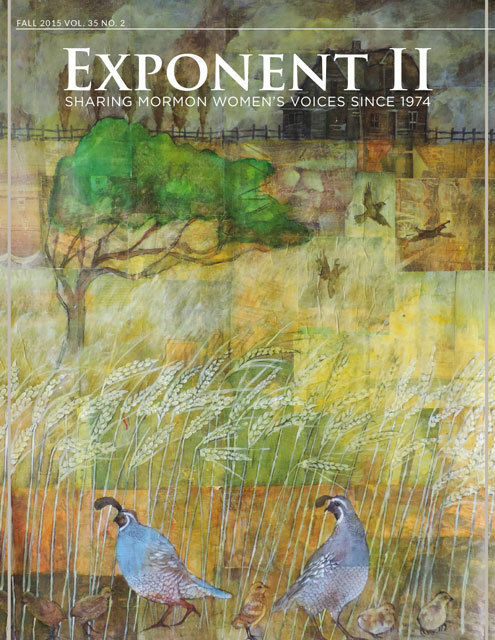 She asked me specifically to talk about that, and also to talk about my Exponent blogging. I was not given a specific time limit, though she said most lecturers speak for about 30 minutes to 45 minutes, with about 30 minutes of question and answer time (though that can run longer, too). Almost all of the speakers have come from our own ward, though an assistant to the Manhattan temple Matron and Claudia Bushman have been two exceptions. Both came from across the river to speak with us. I think they ask anyone they know that has a great story (which they also believe is every woman). It requires knowing the women to know what their stories are. Topics before my time included infertility, being a lesbian And a practicing member, relying on Christ after a family member committed suicide, recovering from an eating disorder, and going through breast cancer. But, they are not always that heavy. Our speaker for this coming Wednesday is a 31 year old actress who owns a preschool, and they once had a J Crew stylist come in and teach a class. Wow. It sounds so great. Particularly the focus that every woman has great stories and all those stories are important. I can think of little else that would do more in building empathy and unity within our sisterhood. Thanks for a marvelous jumping off point! She said that she also has an email sheet of info with more details about the workings. I’ll see if I can get that soon. Rachel, I would love to get a copy of the info sheet! Thank you. She doesn’t know it yet, but my RS president and I are going to have a talk today. I love that, X2 Dora. Mrs. Anne Morrow Lindbergh would have been surprised, I think, to see herself described as “a polygamist.” Her husband, Charles, was indeed a lousy husband and a serial adulterer to boot, but that hardly makes her a polygamist. Mark, thank you for your comment. That might be my mistake (not Claudia’s), and the crossing of two sets of my notes. I’ll have to go back and see, but for now I will take it out. I went to a NYC Little Prince exhibit the same week, and there was a lovely letter (or perhaps journal entry) from Mrs. Lindbergh about the book. I might have scrawled her name on the wrong sheet, to remember later. It is likely that I didn’t write down the name of the true polygamist woman at all. I don’t think Claudia would have gotten that wrong. I went back to my notes, and also contacted Claudia. The woman was first-wife, Emma Nelson, from St. George, Utah. The passage was from 1889. Thank you for your careful reading, and gentle correction. In one journal cycle I was trying to capture 3 thoughts a few times a week: something fun/beautiful, something I have been musing over, something worth remembering. Another time I focused on my scripture journal. I think records of the endless cycle of diapers, small child care, laundry, are worth having a record of. We need to know that our work is Known, valued, validated. All of those things are wonderful ideas, and all of those things are worth recording. I agree. As a blogger, I write my own story a lot, documenting myself as if I were some important historical figure. But what Dr. Bushman says is true. I actually do know more about me than anyone else and I love reading other’s autobiographical sketches too. I love that you link valuing our own stories with valuing others.